Marfa in West Texas had long been on my sightseeing list. 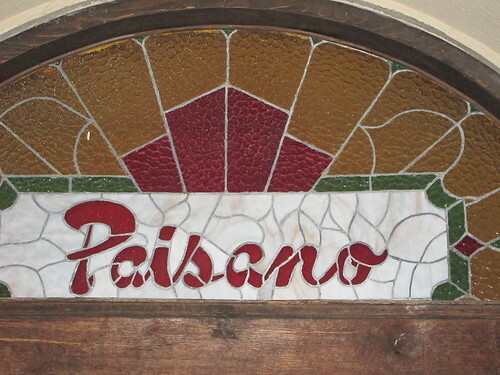 I wanted to spend a night at Hotel Paisano. Why, Marfa? An interest in the movie Giant whose exterior scenes were filmed nearby, the Hotel Paisano where many of the stars stayed briefly, and the Marfa Lights. I visited there last December after a house/pet-sitting job in Las Cruses, New Mexico, as I was en route to Big Bend National Park (See another post National Parks—Big Bend). When I checked in Hotel Paisano, I didn’t request Room 223, where James Dean had supposedly stayed in the early days of the filming of Giant, but that was the room I was assigned. Simple but comfortable. Also my first experience with a wall-mounted heater. The temperature dropped very low that night. I’d been given a remote control and told it operated the heater. I pointed that remote at the old-fashioned radiator I saw in the room, pressing the “Up” button. No heat! After repeating this step several times and getting colder and colder, I noticed a unit mounted high on the wall. Pointing the remote at that unit and pressing the “Up” button produced results. Yes, warm air began to flow out of the unit. Hotel Paisano’s architect, Henry Charles Trost, designed several buildings in West Texas. Others included the Kerr Mercantile in Sanderson, the Gage Hotel in Marathon, the Holland Hotel in Alpine, and the Hotel El Capitan in Van Horn. The latter three still offer accommodations for visitors. On a later trip through Van Horn, I dined at the Hotel El Capitan in Van Horn: chicken-fried stead with jalapeño gravy. 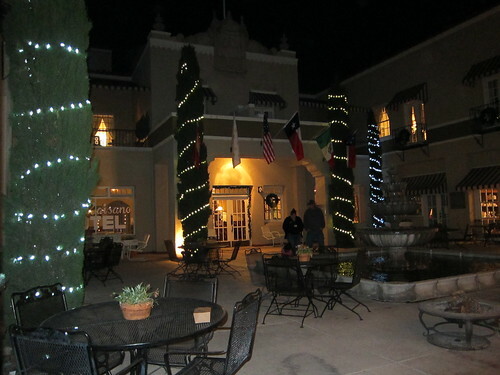 The courtyard at Hotel Paisano was brightly lit for the holidays. Another attraction nearby is the Marfa Lights. “Accounts of strange and unexplained phenomena just outside of Marfa began during the 19th century and continue to this day,” according to the Visit Marfa website (http://www.visitmarfa.com/lights.php#.UiaYimQ-uFY). “The mystery lights are sometimes red, sometimes blue, sometimes white, and usually appear at random throughout the night, no matter the season or the weather.” Are the mystery lights a phenomenon for which there’s a logical explanation? Opinions vary, but you can drive to the official Marfa Lights Viewing Area west of town if you want to chance seeing the lights. If you plan to visit Big Bend National Park or anywhere south of I-10 in West Texas, include Marfa on your itinerary.